About a year ago I was invited to try Suwu. I went, I ate, I enjoyed. I visited a few times after my initial visit, but my experiences were never the same. Burnt food, thirty minutes for drinks, rude waiter and how about that time I ordered drinks and food only to be told forty minutes later that they closed the kitchen ... ??? When I heard SuWu was re-vamping its kitchen, I had high hopes, especially when I learnt who would be in the kitchen! Brunch is my favourite time of the week. 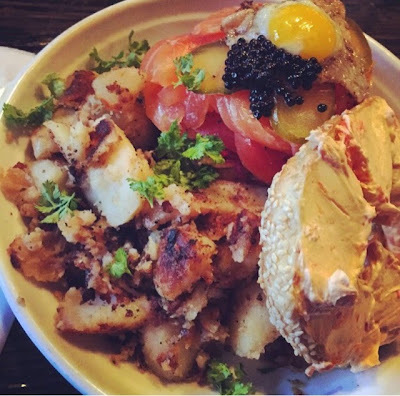 I am always looking for new brunch spots so a few Saturdays ago, my friends and I decided to give Suwu’s new menu a shot. We arrived and were seated quickly. The restaurant was busy but we walked in just as another table was leaving. I knew right away what I wanted to order, the MTL all dressed bagel, but the other options on the menu also begged to be ordered. The service was not the best, I think they need to re-train their entire front of the house, but the food was on point! The waiter seemed very confused as to how he should serve our table. We eventually were able to place our order but not before waiting for quite some time. The waiter arrived and we all ordered the exact same dish, the all dressed Mtl bagel, but I decided to order a side of their sausage of the day. We also decided to try the PB&J doughnut sandwich but without any bananas or bacon. We got our first cups of coffee quite quickly, but getting a re-fill was another story. The staff seemed frazzled and very confused as to what they should be doing. I have seen this a few times at SuWu, even the following Saturday when we went back for more, the restaurant was completely empty and we still had to wait and wait for a waitress to pay us any attention. 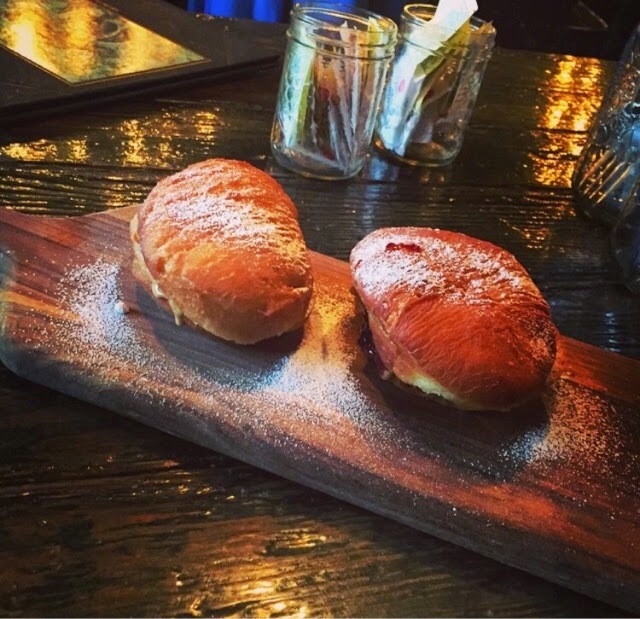 Brunch began with dessert; two soft and delicious Polish Pontchki donuts sandwich together with peanut butter and a house-made jelly. The donuts were light, fluffy and delicious. The house-made jelly was perfect contrast to the rich peanut butter. We liked the donuts but I thought they could use more jelly. Our brunch arrived relatively quickly and boy was it good. 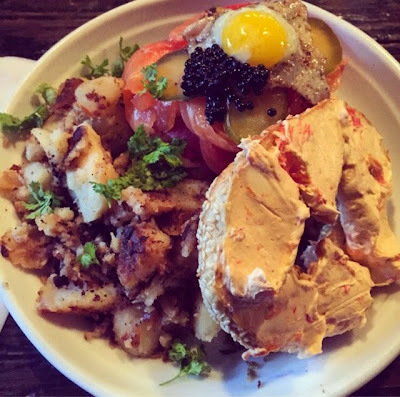 The bagel was fresh and shmeared perfectly with their delicious house made pimento cream cheese and layered with tomatoes, red cabbage slaw, house smoked salmon, a fried quail egg and deliciously salty black caviar. The plate is served with their home-fries which are jam packed with flavor and soft yet crispy and delicious. The house-smoked salmon was fresh and delicately flavoured, we all agreed that the salmon was one of the bests we've had. We all really enjoyed our brunch and all agreed that it was the best bagel, lox and cream cheese we have ever had except for one fact, there was no onion! Maybe it’s the Jew in me but a true bagel, lox and cream cheese must always have onions. Next time I know to order a few slices on the side. Even with that said, the dish was absolutely perfect. The house sausage of the day was pork shoulder stuffed with sausage and slow braised with fennel. The meat was a bit on the fatty side, but the flavor was outrageous. I can honestly say that I have never in my life had such a flavourful “sausage.” The meat was tender, the flavor and smells emanating from this juicy piece of meat were indescribable. The only thing I can say is you must order the sausage. You won’t regret it and you may never taste something like that ever again. After having enjoyed brunch twice this month at SuWu, I cannot wait to go back and try their new dinner menu. Let’s just hope the wait staff is better next time!